In Arizona the summers can reach to about 120 degrees. What’s a better way to cool off than to take a swim in a pool. Buying a home in Neely Farms with your own private pool is perfect for you! 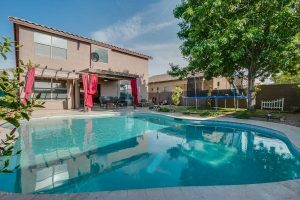 Having a home with your own private pool creates a back yard oasis where your family can retreat to on a hot summers day when there is not much else to do. Private pools are great for hanging out with the family as well as entertaining friends. You can throw your own pool party without having to worry about getting there early to save seats for everyone. Maintenance of a pool is easier than people think! Sometimes often, people think owning a pool will dramatically increase your energy bill, but with newer technology available that isn’t the case. Running your pump at different times can help with the electric costs as well. Having a pool will make your backyard look beautiful. Maintaining your pool is very important to keep energy costs low, and to increase the longevity of your pool and pool equipment. The require chemicals to balance out PH levels and to kill bacteria and algae that thrives in our warm climate water. During Arizona’s dust storm Monsoon season, they can also get mucked up. Having a pool helps keep the kids active during the summer months when it’s hot outside. It is very important when purchasing, if you have children in the home, to notice the pool safety features the home is offering. Some of these features include pool fences, and automatically closing sliding glass doors that automatically latch. It is important to prevent drowning, so these features help keep the kids away from the water when there isn’t adult supervision. The features can be installed pretty easily and cheaply so if the home doesn’t offer it, make sure to do some research as to which safety precaution best fits your family’s needs. Another good thing when purchasing a home is to take advantage of a home warranty that includes your pool and pool equipment. Majority of home warranties have a pool rider where for a small service charge a repair person can come out and check on the unit if something is not working. 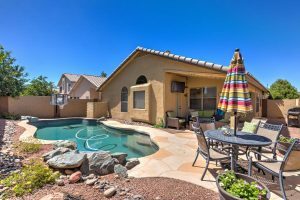 Homes in Gilbert with pools are in high demand and tend to move quickly on and off the market. Contact us immediately so we can help you find a home with a pool that best fits your family’s needs!